Water as required for gravy. 1. Boil the potatoes and cut into 1 inch cubes. 2. Grind cashewnuts, almonds, coconut to a fine paste. 3. Heat oil, saute onion till translucent. 4. Add slit green chillies, ginger garlic paste, and curry leaves. Saute for a few minutes. 5. Add turmeric powder, corriander powder, saute for a few minutes. 6. Add chilli powder and the ground paste and cook for 5 minutes while stirring continously. 7. Add the potatoes, mix well. 8. Add 1 cup of water, cover and simmer till the gravy is thick. Add water as required for thicker or thinner gravy. 10. Add the curd towards the end, mix well. Remove the dish from heat after adding curd. 11. Garnish with corriander leaves. 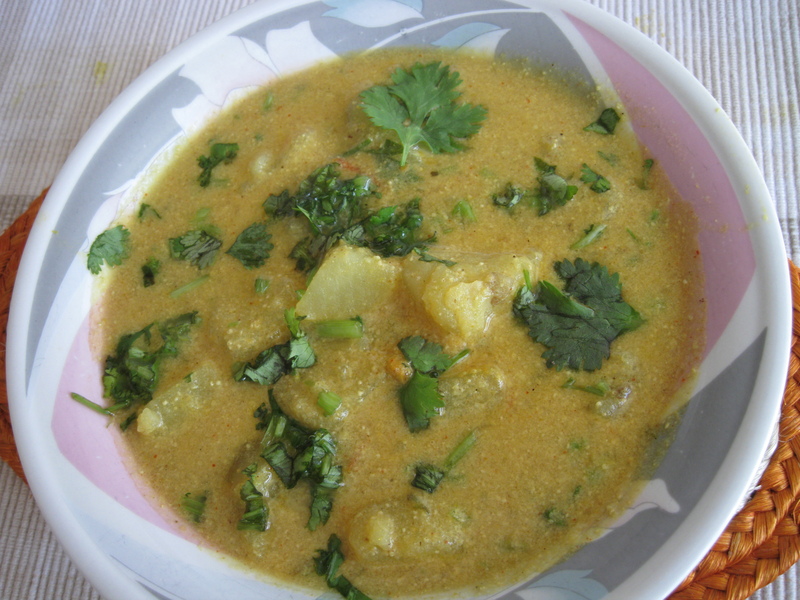 3 Responses to "Potato Korma"
Please include some diet conscious recipes. Thank you for your suggestion. Do you have anything specific in mind – salad or just regular dishes more on the healthy side? Try this it is really filling and healthy – http://indiraskitchen.com/cabbagge-kosambir/. Hope you like it. Thanks. Actually I want the recipes of regular dishes more on healthy side.